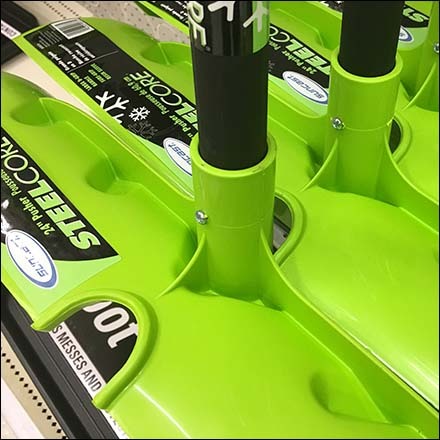 Try this Nesting Snow Shovel Increases Display Density concept to increase improve merchandising for your Hook hung Winter Hardware. Look close to see a semi-circular indent is provided to receive the circular handle shape and save space. A great merchandising concept. But does it affect Snow Scoop efficiency in use? That will require a real-world, snow shoveling test. This Nesting Snow Shovel Increases Display Density example seen at Target. Componentry is Bar-Mount Loop Hooks.